Vaughan Williams’s Songs of Travel cycle belongs to the first decade of the last century when his personal voice was emerging and the work marks a major achievement in his development. The poems are by Robert Louis Stevenson, and the songs were originally performed in a group of eight by Walter Creighton and Hamilton Harty at the Bechstein Hall, London, on 2 December 1904. Most of them had probably been written in 1904, although ‘Whither must I wander?’ predates the others and had been published in the June edition of the magazine The Vocalist in 1902 and also performed that November. Although conceived as a group of integral songs, the commercial demands of the publisher meant that they appeared separately in two volumes in 1903 and 1905, apart from the final song which the composer clearly planned as an epilogue to be performed only when the songs were performed as a whole. This was not published until 1960 in the first edition of the cycle in its original sequence, which was first performed by Harvey Allen, accompanied by Frederick Stone, in a BBC broadcast on 21 May the same year. 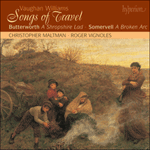 The Songs of Travel made a strong impression on audiences and musicians of the time; for instance, Arthur Bliss, nineteen years Vaughan Williams’s junior, who studied at Cambridge between 1910 and 1913, recalled in his autobiography As I Remember: ‘To us musicians in Cambridge Vaughan Williams was the magical name; his Songs of Travel were on all pianos’. In the context of the development of English song they are important too, for they reflect a significant advance from the parlour song to the art song which professional singers—such as the cycle’s dedicatee, the bass-baritone Plunket Greene—were encouraging composers to write. Here, like the Somervell cycles, was a work conceived in the tradition of the early Romantic questing song cycle of love and loss. Nevertheless, it differs from its models and from Somervell’s works in that there is no real narrative thread from one poem to the next, rather a set of different circumstances on which the poet comments. 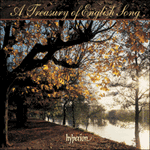 Significant too is the influence of folksong on several of the songs. Vaughan Williams collected his first folksong, ‘Bushes and Briars’, in December 1903 and the experience of finding the lovely traditional tunes is apparent in Songs of Travel. The opening song ‘The vagabond’ establishes the cycle’s Romantic credentials; indeed Stevenson had composed the words ‘To an air of Schubert’. Its steady tramping accompaniment, combined with a triplet which prefigures the opening of the vocal line, evokes the purposeful tread of the wanderer striding out on the open road. ‘Let Beauty awake’, with its images of dawn and dusk, has a fervent melodic line that floats on a buoyant arpeggio accompaniment. Particularly memorable is the bitter-sweet radiance of the phrase ‘And the stars are bright in the west!’, which recurs as a link between the verses and in the brief coda. Over a joyous accompaniment, ‘The roadside fire’ radiates the delight of new-found love that bubbles over ecstatically in the final verse. ‘Youth and love’ is the kernel of the cycle and points to its central dilemma: which is preferable, ‘love’ and by implication a settled life, or ‘solitude’ and the freedom to wander. As if emphasising the choice to be made, the accompaniment includes transformed allusions to the triplet figure from ‘The vagabond’ and the opening phrase of ‘The roadside fire’ at the song’s climax. ‘In dreams’ has a chill melancholy, created through a persistent, uneasy off-beat rhythm in the piano and a brooding chromatic vocal line. Pianissimo, wide-spaced arppegiated piano chords, combined with an expansive melodic line evoke the vast brilliance of the night sky in ‘The infinite shining heavens’, in which the traveller, gazing above, finds peace. 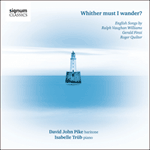 ‘Whither must I wander?’ has a homely simplicity, appropriate to the poet’s images of childhood and the security of home and family which are now long in the past, never to return. In its character it is close to Vaughan Williams’s most renowned song ‘Linden Lea’, composed the year before it. A sole sonorous chord, like a call to attention, opens ‘Bright is the ring of words’, whose forthright melody incorporates the opening notes of the hymn ‘Sine nomine’ (‘For all the Saints’), which haunted the composer throughout his life. The brief epilogue, with its references to ‘The vagabond’, ‘Whither must I wander?’ and ‘Bright is the ring of words’, encapsulates the whole cycle with the wanderer, now old, looking ahead to his final journey beyond the grave. The unremembered tokens in your hand avail no more. No more the morning glow, no more the grace, enshrines, endears. Cold beats the light of time upon your face and shows your tears. He came and went. Perchance you wept a while and then forgot. Ah me! but he that left you with a smile forgets you not. No 7: Whither must I wander? Home no more home to me, whither must I wander? Soft flow the stream through the even flowing hours. Fair shine the day on the house with open door.